This week's Big Fish Games coupon code is for the full version download of hidden object games The Mystery of the Crystal Portal for PC and The Count of Monte Cristo for Mac. 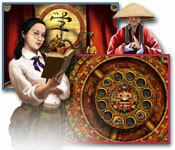 The coupon code below is available for these two hidden object games from 28th of June to 4th of July. Enter the coupon code in the checkout page to get the full version downloads of these games at the discounted price of $2.99, instead of the full price of $6.99 up until the 4th of July. This Week's Big Fish Games Coupon Code - 28 June to 4th July 2010: CATCH299. With this coupon code you can download the full version of The Mystery of the Crystal Portal for just $2.99! For PC. Please note: the Big Fish Games coupon code is only valid for this game until 4th July 2010. To download for PC visit: The Mystery of the Crystal Portal (use Big Fish Games Coupon Code: CATCH299). With this coupon code you can download the full version of The Count of Monte Cristo for just $2.99! For Mac. To download for Mac visit: The Count of Monte Cristo (use Big Fish Games Coupon Code: CATCH299). * Big City Adventure: Vancouver Full Version Download for PC.